One of the main problems of measuring the mixing ratios of gaseous molecular species in stacks is the interference due to the presence of dust and several molecular species, other than oxygen and nitrogen, at high concentrations, and the effect of temperature. When adopting optical techniques, all this produces changes of line strengths of the absorption transitions, changes of line shapes, changes in the transmitted power across the sample and so on. 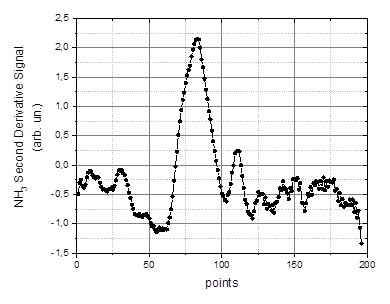 The effects of the perturbation on the results of the measurements depend on the detection technique. The so-called “absolute” measurements, namely Direct Absorption (DA) and Cavity Ring-Down Spectroscopy (CRDS), whose results are based on the spectroscopic data only, suffer small perturbations. All the other techniques (mainly Photo Acoustic Spectroscopy [PAS], both standard and Quartz-Enhanced [QEPAS], and Derivative Techniques [DT]) yield results which must be calibrated. The results of all these techniques are proportional to the laser power, but there are particular features, like density and viscosity of the sample (PAS and QEPAS), and shape of the line (DT), which are not easy to be modelled. We realized an apparatus which can measure at the same time in DA and DT (Fig. 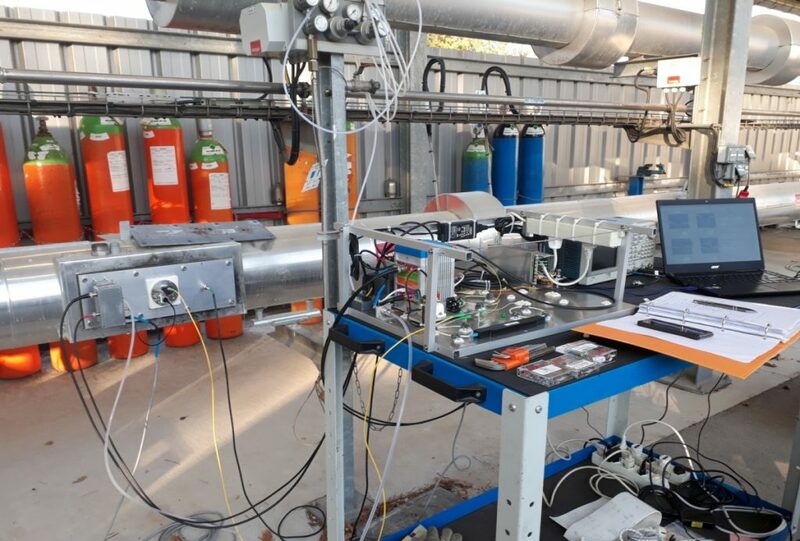 1), in order to compare the results of ammonia measurements while changing concentrations of both ammonia and foreign gases, mainly water vapour and carbon dioxide. 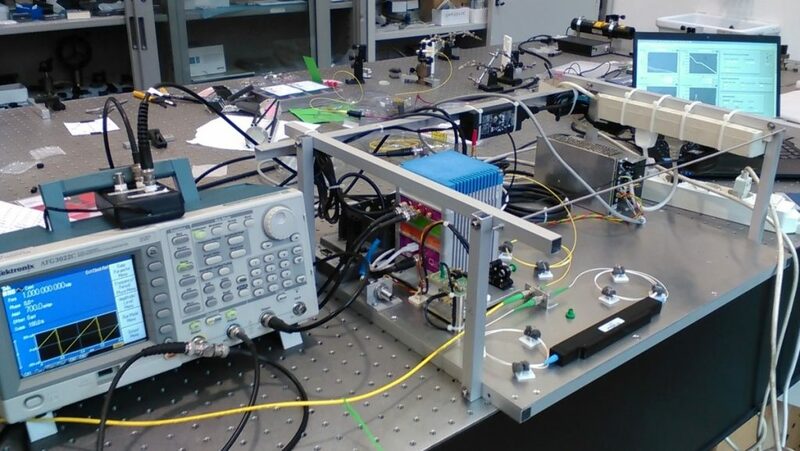 This instrument is based on the absorption of a near infrared diode laser beam in a multipass Herriott cell, to be directly inserted in a stack, to monitor in-situ the concentration of ammonia. This is a test device, to be used in a controlled environment, in which gaseous or light liquid fuel, or wooden pellets are burned, and ammonia is added after combustion. Figure 2 shows the multipass cell, realized in such a way to maintain the alignment in a wide temperature range. For the measurements, it’s attached to an aluminum plate, connected to a port of the test stack. It has been tested in a climatic chamber up to 100 °C (Fig. 3). This is not exactly the real experimental condition. Only the cell undergoes the temperature variation, while the plate which holds it is at room temperature. In the real conditions, the plate is in contact with the hot gas inside the stack. Nevertheless, it is quite a reliable test. It confirmed that the cell can resist at least up to 100 °C, without misalignment. The next step was to go and take measurements on an artificial stack (Fig. 4). 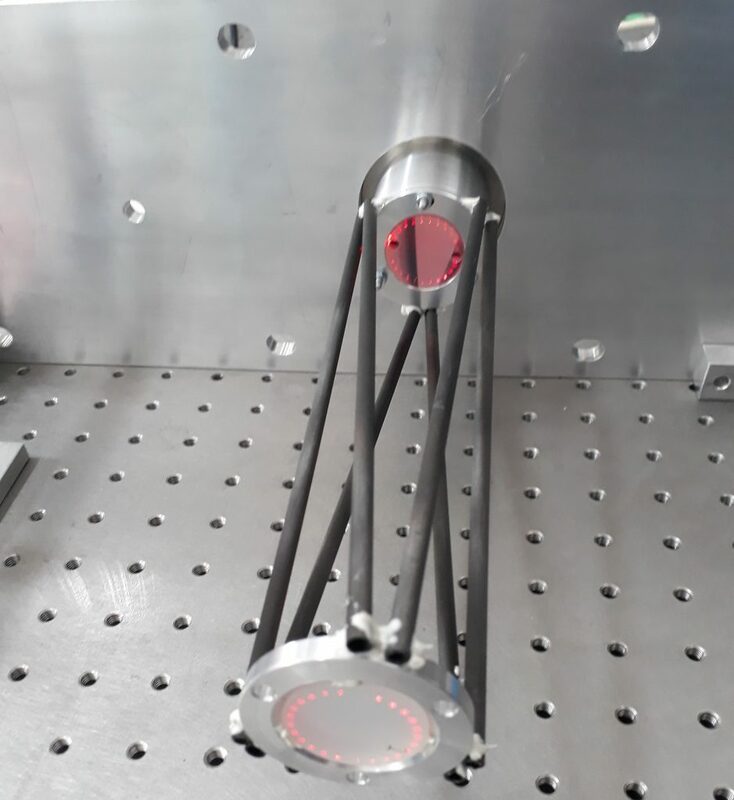 The measurement campaign lasted four and a half working days, during which the optical system maintained its alignment at the temperature of 140 °C. The optical transmission depended on the burned fuel. As expected, it was high and stable with methane, lower and slowly decreasing with time, when light liquid fuel was burned, and still lower, and slowly decreasing with time, when wooden pellets were used. 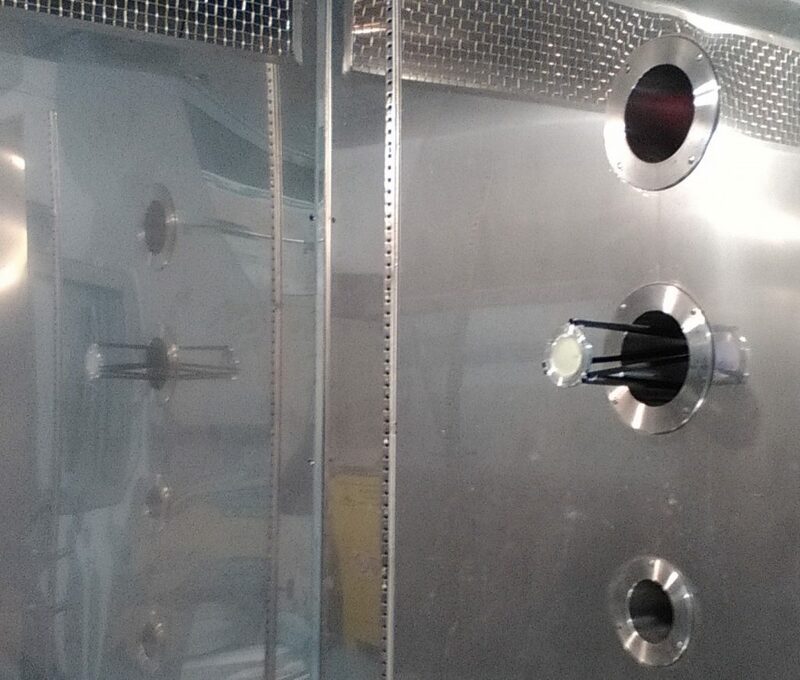 For continuous measurements some tricks can be used, to prevent the contact of the exhaust gas with the cell mirrors. During the campaign, absorption spectra were acquired at different ammonia concentrations, with different fuels and mixture compositions. The final feature was obtained with the burners on or off. With burners off, heated ambient air was the carrier in which ammonia was injected. So the concentrations of water and CO2 was roughly the standard in the atmosphere, while with burners on a significant amount of these two molecule was added. Data analysis is in progress. 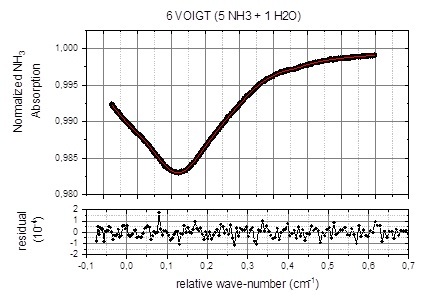 An example of direct absorption fit, with its residual, is shown in Fig. 5. The corresponding second derivative signal is shown in Fig. 6. For more information, please visit our WP1 Activities page.